I’m reviewing which of my earnings come from where, in my slow march towards diversification. 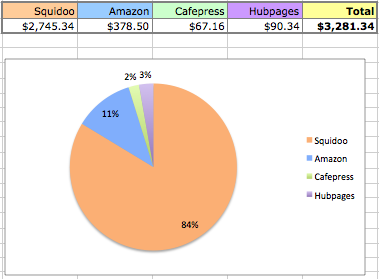 Last year, by the end of the year, Squidoo still accounted for 95% of my earnings, and most of the rest was Amazon Associates (despite Amazon Associates in California getting punted for several months). Alas, nearly all those Amazon Associates were Amazon links embedded on Squidoo lenses, not on my blogs or other sites. That’s bad, because if Squidoo ever has problems, Associate links embedded on those articles will get clobbered too. Squidoo is mostly tier payouts. But how much? For the most part, I have Amazon Associates links embedded on Squidoo lenses, but I also have the odd Amazon module here or there. A question on SquidU induces me to check out my Squidoo earnings breakdown to see which parts of my Squidoo payouts are from tier payouts. Keep in mind those are all for Squidoo’s built-in modules, not 3rd party associates links, which are on the pie chart above. In short, my Squidoo earnings are still mostly tier payouts (as opposed to sales commissions), and my overall earnings are mostly Squidoo, either through Squidoo payouts or through third party affiliate links on Squidoo lenses. Getting Ready for Hobbit Hype…What Are You Getting Ready For? A good and bad aspect of writing online for a living is that everything you love becomes potential writing fodder. As usual, you have to find the “What you love / what people are searching for” overlap: I love J.R.R. Tolkien’s “The Fall of Gondolin” story in Book of Lost Tales, but few people are searching for it; those few people who love it are all on some Lord of the Rings fan forum talking about it. They’re not going to find an article I write on it unless I write a really good article on it, and lots of other really good Tolkien articles, until finally I get a following of Tolkien geeks. That’s social promotion, which works by word of mouth. 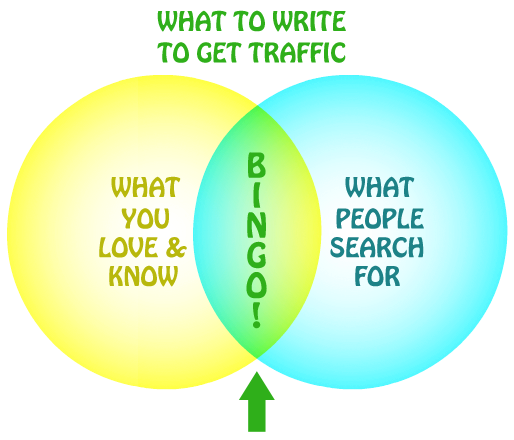 Search engine optimization means automated traffic: people finding your content through searches. Not all aspects of a topic get search traffic. (“Fall of Gondolin.”) But many do. I’ve learned by trial and error that common search traffic queries related to science fiction and fantasy fandom are collectibles, toys, and costumes. People want Harry Potter legos and Star Wars action figures and Xena swords. Being part of science fiction fandom, I also like some of these things, enough to research and write about them. Bingo! Being a longtime Tolkien fan, I know that another Tolkien book is being turned into a movie — two movies — and that as with The Lord of the Rings films, there will be collectibles, action figures, replicas, toys, stuff. But of course, if fans just want to buy that stuff, they’ll go straight to Amazon and look it up there, bypassing Google and bypassing my lenses. They don’t need me to natter at them about that stuff! So product-related articles must do more than just showcase the product. They must provide some kind of information that fans want that Amazon doesn’t cover. If you are a fan, you know what fans find interesting or want to know, and it’s your job (a fun job!) to research and provide that info. For example: The origin of Hermione’s Time Turner and how it works. The colors of different Jedi lightsabres. Costume details on Thor’s armor, and how to make it (and where to find materials to make it on eBay for cheap). This is where your fan expertise suddenly becomes useful, instead of merely an embarrassing hobby: you can answer questions that Amazon can’t, related to things. In my case, I like swords (there’s an Éowyn bottled up in me somewhere), and I like Elvish and runes and dead languages. I paid attention to the props and replicas in the LOTR films and noticed all the Elvish runes written on them. So what am I doing, on days when I can’t think of more educational and thoughtful topics to write about? Amazon product images let me grab photos, and the Fair Use policy of a “limited excerpt” for critique/commentary lets me use a credited close-up photo for analyzing and reporting on the inscriptions on each weapon. The details of what I’m doing aren’t important except as an example of how to mine an interest for an angle that’s likely to draw traffic and drive sales. I’m getting ready for the Hobbit films. What are you getting ready for? 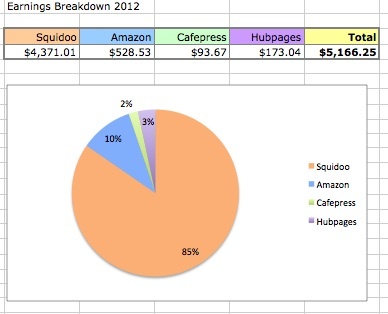 Squidoo, Hubpages and Wizzley users make money through ad revenue and affiliate commissions. Many of us who come to these sites with basic writing skills are shy about sales lenses. We take a pussyfooting approach instead: we write on something we love, and include links to products that might interest our audience. I call this second approach coincidental sales: you’re not writing a product review, just hoping that visitors will stop what they’re doing (reading your article) to buy. Obviously, this isn’t quite as effective as the direct sales approach, but there are ways to tweak it. My very first two reliable sales lenses were my Thoth article, an essay on Egyptian mythology, which I’d divided up with some Amazon product thumbnails more as visual decoration than to sell anything, and my “How to take your pet on a plane” article, where I included a spotlight on a particular pet product I use. In the former case, I learned that you can break sales modules “best practices” — a keyword-rich header or caption for search engines, a large picture and personalized review for people — if the textless thumbnail images are so puzzling, intriguing, or provocative that people tend to click on them. Another excellent example is posters or signs that obviously have funny captions, but are slightly too small to read. I shamelessly use a block of Zazzle “demotivational posters” on my Funny Signs lens for exactly this reason. (I don’t get many Zazzle sales, but at least I get clickouts). People click images. Surprisingly, they even click images which are decorative elements on the page. Getting them to Amazon is like getting people inside a department store — it won’t guarantee a sale, but it’s a start. And again, on Squidoo, clickouts boost lensrank. The second lens I mentioned above, the “pets on a plane” lens, was useful in that it showed me there was a market for a particular product. Multiple “coincidental” purchases of the same product meant I should break the lens off and create an actual sales lens devoted to that product. Direct sales lenses, however, are more powerful. People use the web to buy things. Don’t be embarrassed to help them. After all, you search the web to buy things all the time yourself, correct? If you provide useful, actionable information that can help someone find what they’re looking for, then you’ve earned your pay more than half those folks wearing orange, green or blue aprons in big box retail stores. Identify the product in the opening sentence, or declare what kinds of products your page covers. Establish yourself as trustworthy and knowledgeable. Polished prose helps. Stay brief, focused, and to the point. They want information to help them decide whether to make a purchase. Give them that information. Don’t give them something else. “Talk benefits, not features.” The most valuable lesson I’ve learned on sales is that people want to know what’s in it for them, not how many whoosiwhatsits it has. Use crisp, eye-catching graphics, if you can. There is nothing wrong with having a BUY button near the top of the page for those who make their minds up quickly, and another at the end after you’ve covered it in more depth. I am learning to create two kinds of sales lenses. You’re not just pushing them to buy, buy, buy. You are serving as a concierge, researching all the products of a certain kind (Digital SLR cameras, e.g.) and presenting your recommendations for the top five or ten. Basically, you’re being a one-person Consumer Report, saving your readers time and effort by helping them find the product that will best suit their needs. In this case, you start by saying you’re going to review the best [cameras, kitchen utensils, cars, books, dog breeds, software, or other thingies] for X, Y, and Z. Say this right in the first sentence. You need to tell people the page has what they’re looking for. Then deliver on that promise. Be brief, but personable. Show you know what you’re talking about. (Polished writing helps.) Link to products that also have good customer reviews; if they don’t, you’ve got the wrong product. Go beyond Amazon customer reviews to the web at large — heck, do look at Consumer Report, and other sites too — to learn what you can about the products. You don’t want to overwhelm; your readers are in a hurry and want a few facts (or features), not an essay. You don’t want to lift reviews or copy from anywhere; write in your own words. But research and learn so you can give good info. Again, start the article by saying what you’re covering. What’s in it for your reader? They’ve come to find out about the Widgetbat XT 3000, not your feelings on widgetbats in general. Use the product name — brand, model, number — in the page title and URL, if possible, to attract the precise people who want to know about that product before buying it. They’re researching it. Again, give them more than they’ll find in Amazon reviews, otherwise there’s no reason for them to read your page as opposed to going straight to Amazon. I list features, what I use it for or like it for, pros and cons. I highlight the main product in an Amazon Spotlight. I also give a few alternates below for people to make their own comparisons. “Other products like this.” I include shorter blurbs on them.